In certain spiritual senses that occur in meditation, one realizes that whatever sensory input one is receiving is a holy thing -- music for example. We are so used to having it at our disposal via electronic devices that we take it for granted-- as background. But music tames the savage beast, as does beauty--another thing that's available just by walking past the newsstand. In this way we've become numb to the power of beauty/music, and yet, during profound spiritual epiphanies--whether brought on by divine intervention, insanity, prolonged meditation, or psychedelic drugs, the inevitable synchronicity of the perfect music at the perfect time becomes incredibly obvious; how could it be any other way? To think "oh but that's just ego talking" is like looking at a beautiful statue by Rodin and saying "Aw, you can't fool me! This isn't a reclining woman, it is just a bunch of clay hardened in a fire!" In ego-free "in the moment" thinking one is able to see life and reality as one sees the Rodin sculpture instead of the clay. One realizes that on some level they cannot quite begin to fathom, they are both Rodin and the sculpture and the one who views and appreciates the sculpture. Our basic perception of ourselves as humans in the world is limited by blinders of necessity… with the opening of our perceptions we see how a larger self stands around our darkened edges, like a giant mother influencing our behavior through whispered suggestions. This higher self has been known, in past cultures and in Jungian archetypal psychology, as the king. The reason I mention all this in relation to Peter Jackson's King Kong remake is because certain films come along at certain times as reflections of our collective unconscious in just this way, striking us in our collective heart and becoming more than a celluloid escape. Now there are a lot stupid little additions to the original story present in Jackson's movie, but there is no denying the power of the ape himself, a masterpiece of acting and CGI effects. His incredibly expressive face and movements are distinctly animalistic, but there are flashes of human recognition through the din. When anger comes he seems to roll back into the animal, but Naomi Watts as Ann seems to bring forth the best in him, like an angel would for us, like a higher power. In this case, as small as she is, she is like the ape's inner child, his infinitesimal Jungian anima, which--now that he is awakened to it--becomes suddenly has something to defend and protect in his hostile out of control world. Just as, for us, this combination of computer graphics and expressive acting become something to cry over, so does this tiny human become, for him, something to die over. We have lost our king! I am not talking about bowing low and saying "Thank you sir, don't torture me, Sir," as Dubya comes and takes all your money away. I'm talking abut the "inner king" who "belongs" to us all and whom we belong to. This idea of serving someone, serving a higher being who inspires a little fear but whom we know to be fear and to whom we are loyal unto death, what happened to it? It was shot down atop the Empire State building, slain in the night by MacBeth… and since then we have been led by little men on whom "the robes of ---- hang as if the clothes of a giant upon a dwarf. " One by one in our meditation chairs, or in groups of AA and yoga, we are getting our savage, graceful king back. This is natural because we have not had a real king in quite some time. The ones we did have were assassinated in the 1960's. For awhile we were content to mourn; then we were content to trust in shabby clown kings like Reagan. But now we have a legacy of corruption in the white house that shows no intention of going away anytime soon, we have a president without a kingly bone in his body, who spends his days eyeing the constitution the way a cat eyes the goldfish bowl. The land is darkened with fear and dog-eat-dog darkness just like Narnia under the snow queen, just like Skull Island in the rain, just like Jackson's depression-era New York City, with cute blonde waifs pressing their noses against the warm café window, whining in hunger while fat cats gorge themselves within. Into this sort of wasteland, a king cannot help but come, and the king will be as a beast unto the men who stand against him. The success of these films is strong indication of the public's changing opinion against the way the world is currently being misused. Right now it's just a glimmer of hope expressed in the fantasy realm of cinema, but these things have a way of becoming the reality of tomorrow. Not that there is likely to be a giant ape or lion becoming president, but maybe--at least, an Arnold Schwarzenegger. 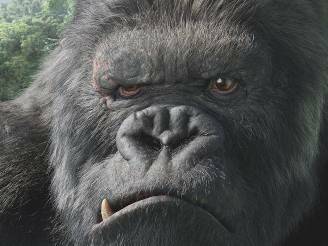 If we have a White House filled with greedy fools who inspire only the basest contempt, at least we have a great, tragic, glorious giant gorilla on the big screen, and in the cinema next door, a lion. 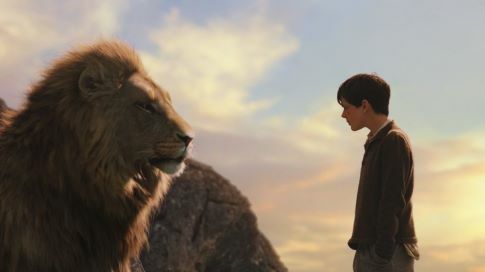 "Beauty killed the beast," that may be true, but don't forget that "Aslan is on the move!"